2.1.1From the home page, click on the Goals icon. 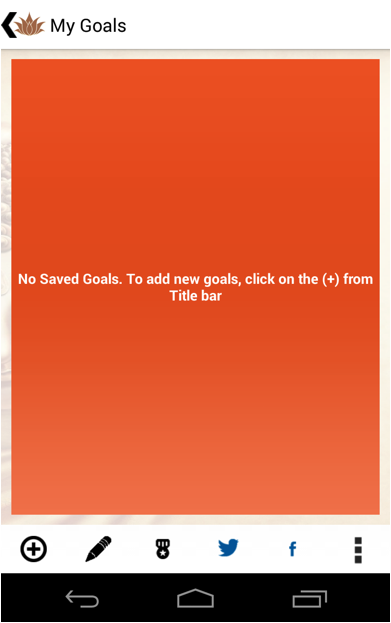 2.2.1 Click on the goals icon from the homepage -> goals screen will display existing goals. 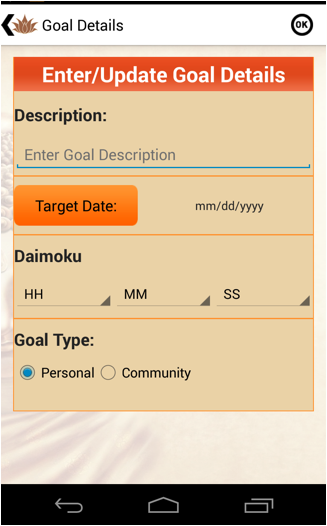 2.3.1 Click on the goals icon from the homepage -> goals screen will display existing goals. 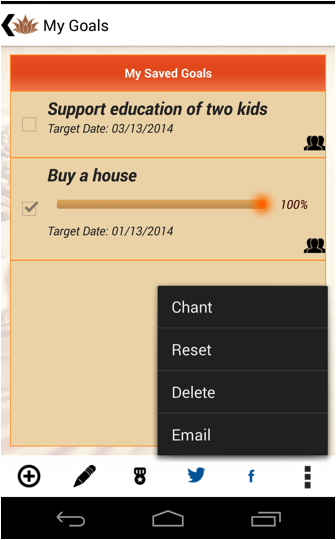 2.4.1.3 You will be directed to chant screen, click on the start button. 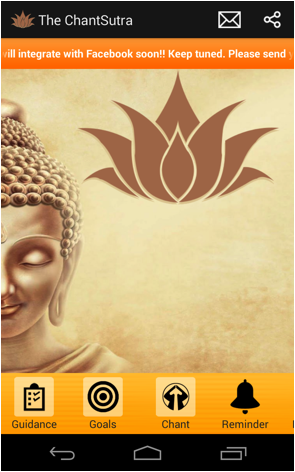 Once done chanting, click on the stop button. 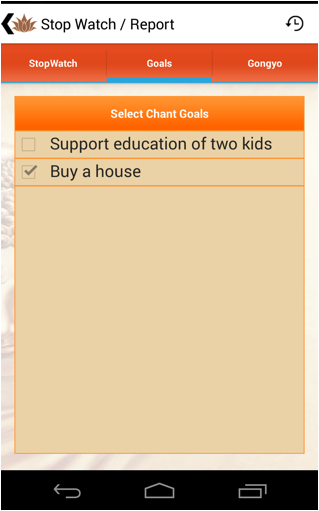 The chant duration will be added to the goal chant duration. Click on the start button to start chanting. 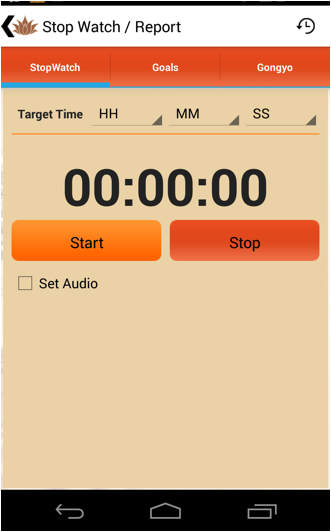 Click on stop button to stop chanting. 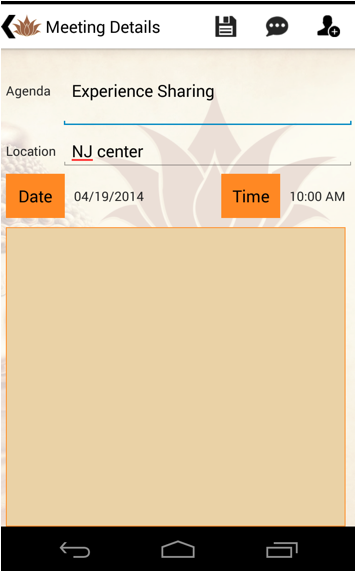 If target time is selected, the phone will vibrate when the chant time matches the target time selected. 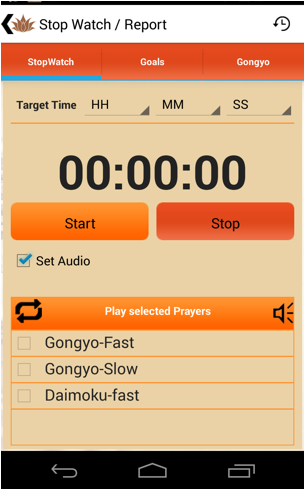 Click on the Set Audio – to chant with pre-recorded Gongyo and Daimoku. 4.1.1 Click on Meeting Icon on the home page and please press (+) on the top menu. 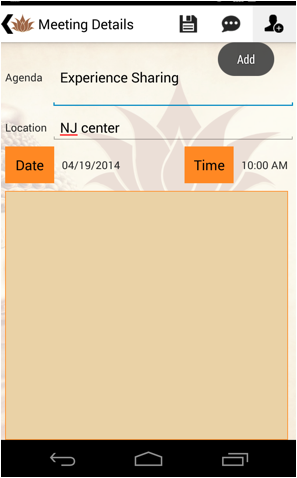 4.1.2 Agenda for the meeting, Location, Date, Time can be set as per the schedule. 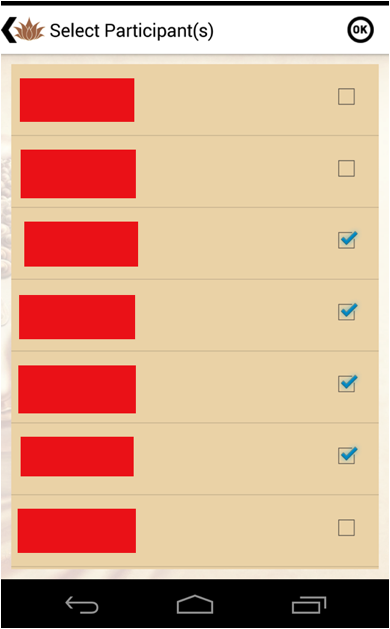 Select participants and click on OK.
From the home page, click on the meetings icon. 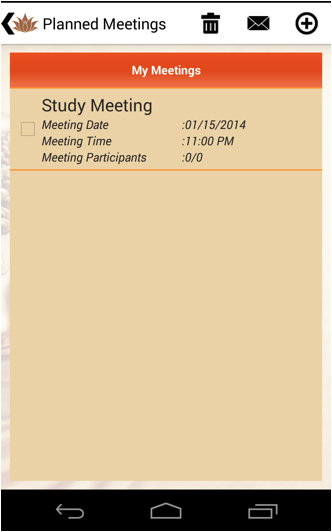 Tap on the meeting to record the attendance for. It would open the update screen. 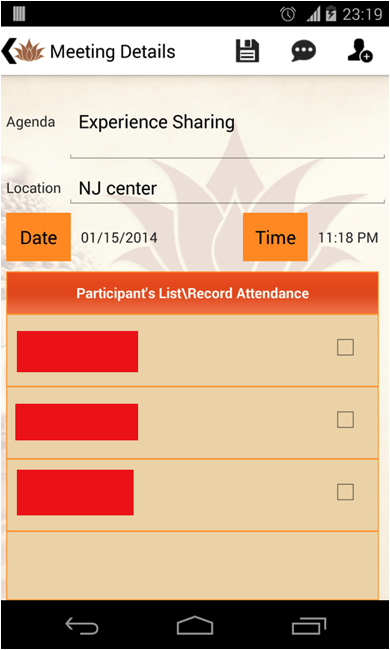 Click on the checkboxes next to invitee's name in 'Participant List\Record Attendance' section to mark the attendance. 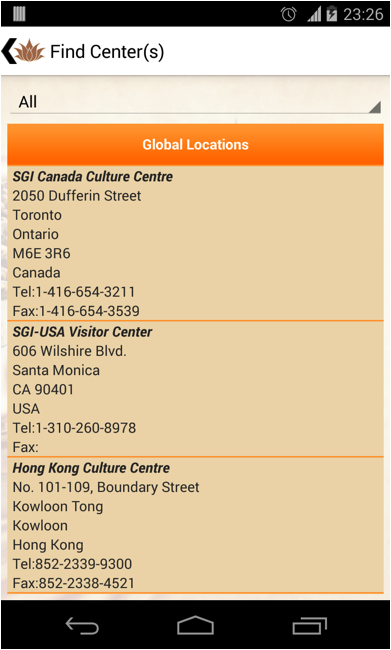 Please select the country you want to choose – it will open it up in google map. 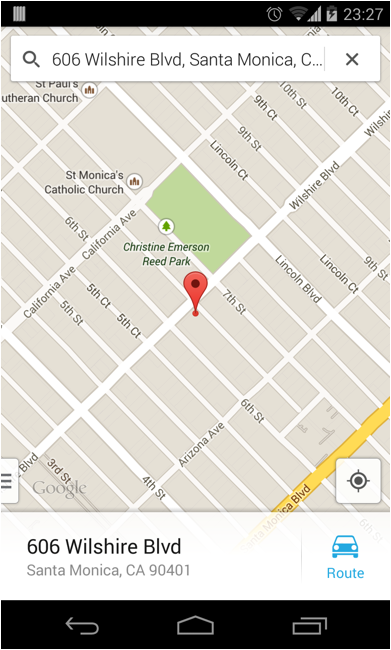 You may use to navigate to the desired center. Under settings you have to put your user id and password to access to post on Facebook and Twitter from this app. Press check box to login to Facebook /Twitter. 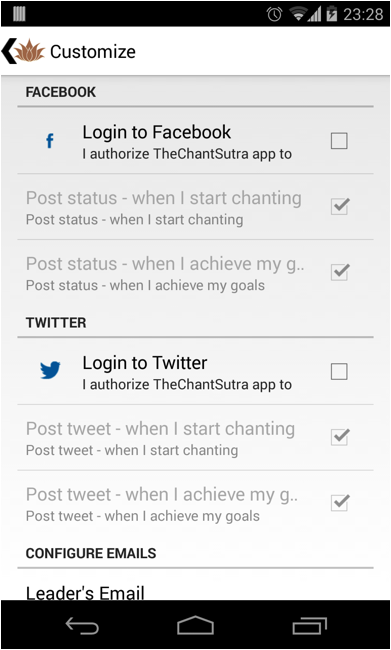 Post Status – when I start chanting: Posts on your Facebook \Twitter whenever you start chanting. Post Status – when I achieve the goal : Posts your victory on the Facebook\Twitter.